Employing Six Sigma Metrics Balanced Scorecard for Excel effectively manages Six Sigma as a continuous improvement initiative. 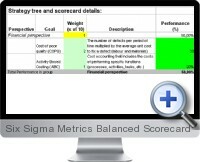 Six Sigma Metrics Balanced Scorecard for Excel not only identifies new ways to consider and measure what important to the business, but also creates better data for which the current business metrics are based on. With management leveraging better business data, a more informed strategy can be put in place that addresses client needs and how the business can more effectively address them. Ideally, Six Sigma metrics should be fully incorporated in the rest of the business analysis.